The 30' Canare 4S11 Star Quad Speaker Cable is a handcrafted audiophile-quality speaker cable with banana to banana connectors. 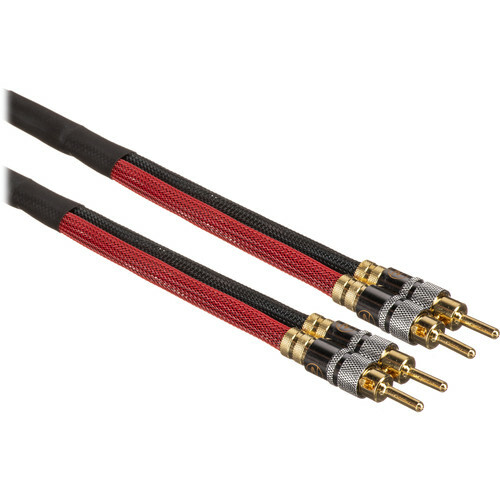 This premium speaker cable utilizes 11 AWG Star Quad cable, which virtually eliminates EMI while offering minimum resistance and a high-quality frequency response due to low capacitance. Designed for home theater, this hand-soldered cable utilizes a gold-plated banana connector at each end and features true silver soldered connections. Note: Note: This is a single cable, with premium locking banana speaker connectors on each end. Must purchase 2 cables for a speaker cable pair. Conductor: 11 AWG, stranded annealed copper conductors for flexibility and long life durability. Box Dimensions (LxWxH) 9.8 x 7.0 x 2.0"